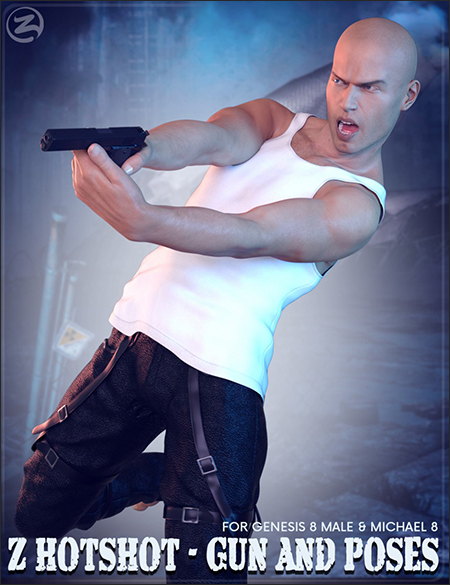 Z Hotshot – Gun and Poses is an intricate and exciting prop and pose collection. The Gun has been created to a high standard, with a focus on the details so your renders can look fantastic close up as well as far away. It has been packaged in a way that makes it very easy to use, so when you get ready to make your first render, it just works every time. All poses have been carefully adjusted for both Genesis 8 Male and Michael 8. The set includes 20 Poses with Mirrors. They were made to look lifelike and handsome. Each pose was created with a focus on the little details such as lifelike hands, natural positioning and realism. 20 Fierce Poses with Mirrors.